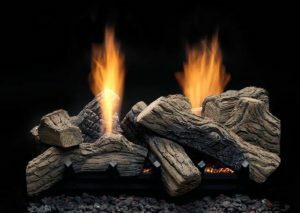 Do you want the ambience of a fire in your fireplace without the hassle of hauling wood and shoveling ashes? Do you want to avoid the smell of wood smoke in your home? Gas logs are a cleaner, easier alternative to a traditional wood fireplace. But it is important to be just as careful with gas logs as with wood. Gas log fireplaces have a specific set of safety precautions that must be followed to keep your home and family safe. If you currently own or are considering converting to gas logs in Greensboro, NC, be sure to follow these safety tips. Do not install gas logs yourself. This process should only be performed by a licensed contractor. Gas lines and electrical wires should only be handled by trained technicians who have experience with installation or conversion of gas log fireplaces. Check county and city building codes. There are restrictions on gas log fireplaces in residential areas. Be sure you and your contractor look into the county and city codes regarding the installation of gas log fireplaces in your area/home before making any changes. Be sure all necessary detectors are installed. Carbon monoxide detectors, smoke detectors, and oxygen depletion sensors should all be in place to ensure safe operation of your gas logs. Have your chimney swept. If you are converting from a wood fireplace to a gas log fireplace it is very important to be sure your chimney is clear of all debris and soot. Schedule routine maintenance for your gas logs in Greensboro, NC. Proper and safe operation of a gas log fireplace depends on yearly maintenance by a professional. This is an important step each year that should be taken care of before your fireplace is used. Maintenance should include a thorough cleaning of the logs, accessories, fan, air circulation passages, vents, and the glass screen. Your carbon monoxide detector should be tested and the batteries replaced. If you smell gas: make sure all people immediately leave the home. Call 911 from a safe distance. If you notice unusual smells or a change in the appearance of the flames: call your gas log service provider or another gas log fireplace professional. Be sure you know how to use your vented or unvented logs. If your gas log fireplace is vented, make sure your chimney flue is locked in the open position. If unvented be sure you limit your use to a few hours at a time to avoid excessive carbon monoxide buildup. Safety is of utmost importance when it comes to fireplaces of all kinds. Berico wants to make sure you and your family will be safe this winter as you heat your home. If you are thinking of converting from a wood fireplace to gas logs in Greensboro, NC, a licensed Berico technician can perform this installation and recommend the best option for your home. If you already have gas logs, Berico can service them to ensure safe and efficient operation. Call for a free estimate or to schedule service: (336) 273-8663.